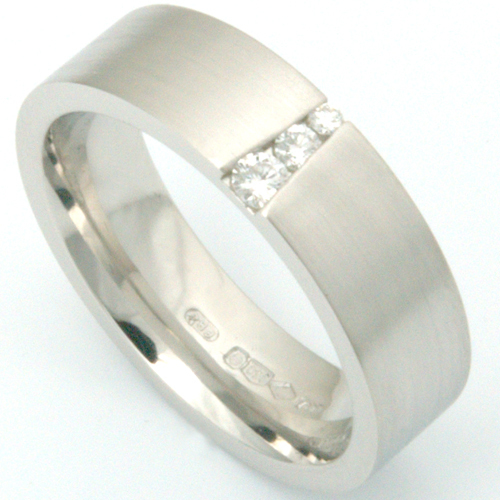 Platinum Diamond Set Satin Finish Wedding Ring — Form Bespoke Jewellers Ltd.
A satin finish and graduated diamonds create an elegant wedding ring. The customer contacted Form Bespoke Jewellers after coming across our website. They had a good idea of the style of wedding ring that they wanted and then worked with the team in Leeds to create their perfect ring. The platinum band has been textured with a satin finish to give a contemporary look and the graduating round brilliant cut diamonds are invisibly set for a beautifully simple finish.